Our organic makeup remover pads and face cleansing washcloth gloves replace 10,000 wasteful cotton rounds and disposable makeup wipes that pollute our planet. Our product can be washed and reused hundreds of times, saving you money and reducing landfill waste. Even our plastic-free packaging can be recycled! Washable, reusable makeup remover pads & microfiber face cleansing gloves clean and exfoliate skin. Use with your favorite skincare products for a deeper clean feeling. Our washable rounds are double layered, super soft bamboo velvet. 100% organic and luxurious feeling. Use to remove makeup and apply toner and micellar water. Ultra-plush microfiber face cleansing washcloth gloves exfoliate and deep clean pores and remove dead skin cells. Great for acne and sensitive skin. Can be used all over face and sensitive eye areas. Gentle and safe enough to use on children and pets. Perfect for everyday use, travel, or gym. Makes the perfect gift for makeup lovers and eco-friendly enthusiasts. 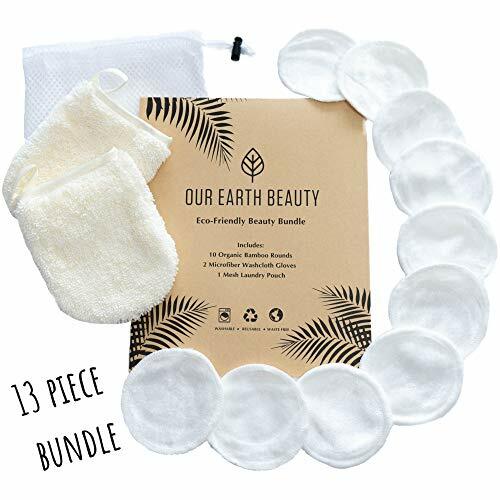 Our Earth Beauty offers the highest quality, most luxurious reusable makeup remover pads and face cleansing gloves on the market. If you are unhappy with your order please let us know! Your satisfaction is guaranteed.